Deacon Leo Gahafer, St. Brigid Catholic Church; Tim Park, EdD, director of Spiritual Health, Emory Johns Creek Hospital; Noor Abbady, Islamic Speakers Bureau; Marilyn Margolis, Emory Johns Creek Hospital CEO; Manharlal Valand, Chinmaya Mission Atlanta; Geshe Ngawang Phende, Drepung Loseling Monastery; and Rabbi Judith Beiner, Jewish Family and Career Services. 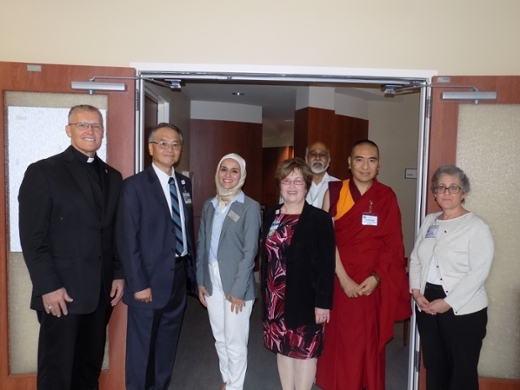 A new interfaith sanctuary is now open to patients, families and staff at Emory Johns Creek Hospital (EJCH). Local faith leaders from Hinduism, Judaism, Islam, Buddhism and Christianity participated in blessing the new space on Thursday, Aug. 4. Tim Park, EdD, director of Spiritual Health at EJCH, expressed his gratitude to the community for their prayers and support to help open the sanctuary. Park says the sanctuary will provide a safe and welcoming space for people of all faiths to find emotional and spiritual rest. The ceremony also honored Rev. Ray Batson, who has donated more than 8,000 hours of spiritual care to the hospital since it opened in 2007, until his retirement in 2013. “To say he’s been devoted to the hospital is an understatement,” says Marilyn Margolis, EJCH CEO. “He gave all of his time providing spiritual care to patients day and night and his service is most deserving of this honor,” says Margolis. EJCH’s Auxiliary named a tranquil glass waterfall inside the sanctuary in Batson’s honor because of his incredible service. A panel discussion called “Sacred Space: Spirituality, Healing and Sanctuary” was held following the sanctuary ceremony. Local faith leaders who participated included: Judith Beiner, a Rabbi and community chaplain with Jewish Family and Career Services of Atlanta; Noor Abbady, a certified speaker with the Islamic Speakers Bureau of Atlanta; Geshe Ngawang Phende, a Tibetan Buddhist monk and a resident teacher at Drepung Loseling Monastery in Atlanta; and Father Tri John-Bosco Nguyen, a Catholic priest for the Archdiocese of Atlanta and assistant pastor at St. Brigid Catholic Church in Johns Creek. The opening of the $197,000 sanctuary was a partnership between EJCH and contributions from special donors in the community, including a major gift from EJCH’s Auxiliary. The 701-square-foot space includes the waiting area, intern area, spiritual health director’s office and the sanctuary space. The sanctuary is located on the main floor of EJCH, near Physicians Plaza. It is open 24 hours, seven days a week. For more information call 678-474-7000 or visit www.emoryhealthcare.org.